Lindsay and Devon married this past Saturday at Breaux Vineyard. Lindsay and her groom were absolutely stunning and the wedding party looked magnificent. 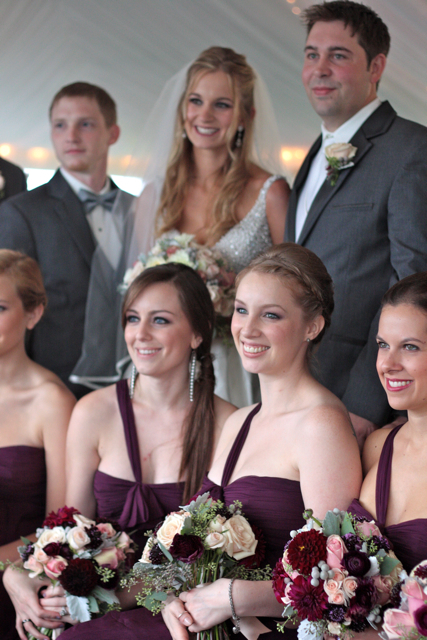 The tones and colors of this wedding were perfect. When I saw Lindsay’s dress, I was in awe. 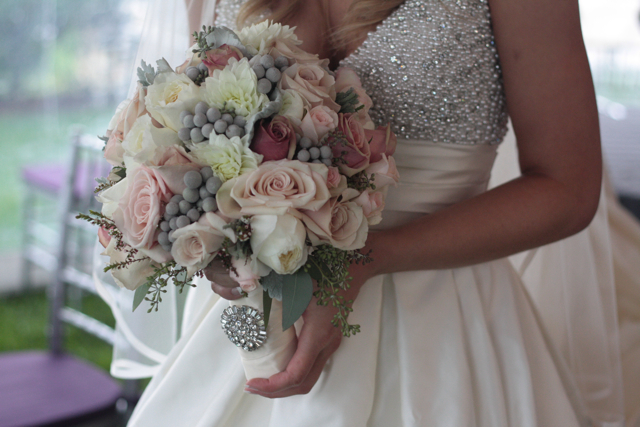 The beading on her gown was perfect with our decor and everything was sparkling so beautifully. 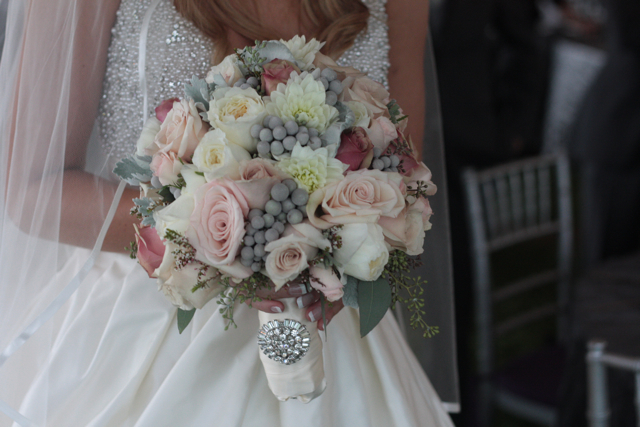 The bridal bouquet was created with silver brunia, silver dusty miller, silver finesse roses, white dahlias, white cabbage roses, sahara roses, spray roses and calcynia heather. 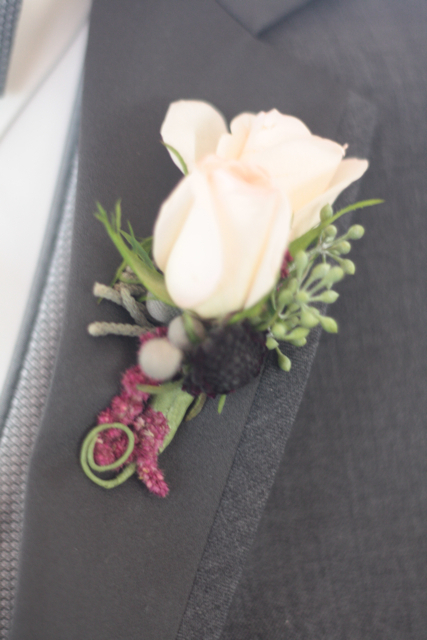 A brooch from the brides family was added to the bouquet for the finishing touch. 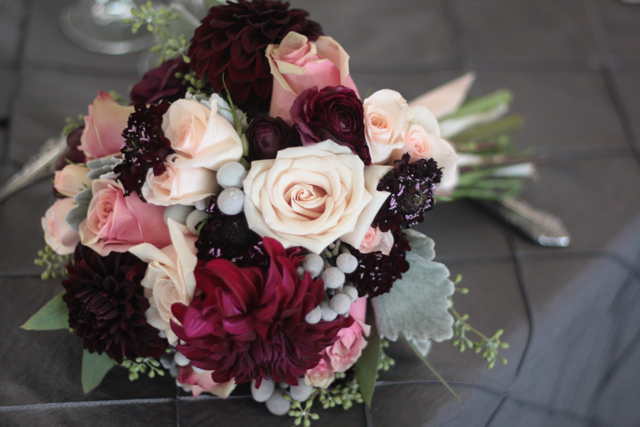 The maids bouquets were created with Don’s Dahlias, silver brunia, dusty miller, seeded euc, sahara roses, plum ranunculus, plum scabiosa, spray roses, and silver finesse roses. Bouts, were created with hanging amaranthus, spray roses, seeded euc, and scabiosa flowers. 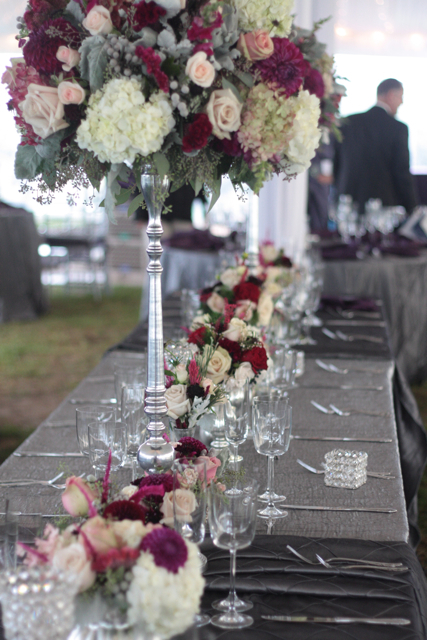 The tables were designed with a mix of our silver stands, crystal beaded stands, and mercury glass. 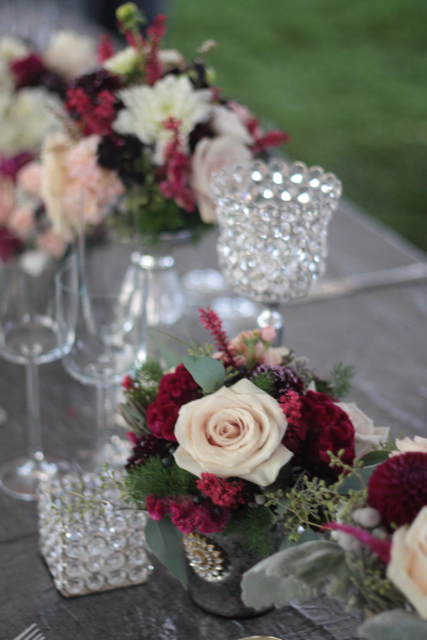 All of the above listed flowers were used to create the centerpieces but masses of peegee hydrangea, white hydrangea and wine toned snapdragons were added into the big designs. I wanted to send you a quick email and say thank you again. I was/still am, completely blown away by how gorgeous your flowers were. They were without a doubt the most stunning flowers I have ever seen and I am so excited that they were a part of my wedding! I never in my life thought I would have such gorgeous flowers at my wedding. You are so gifted, your creativity is amazing! Even though the weather that day was terrible the inside of the tent was stunning thanks to your flowers and candle centerpieces. And, not only were your flowers amazing, but so where you. I so appreciate your help designing the alter for the ceremony at the last minute and also helping to shield me from all the guests when I was walking into the tasting room. I will without a doubt recommend you to anyone and everyone that I know who is getting married. Again, thank you so so so much for helping create my dream wedding. I know that no other florist would have been able to do what you did. 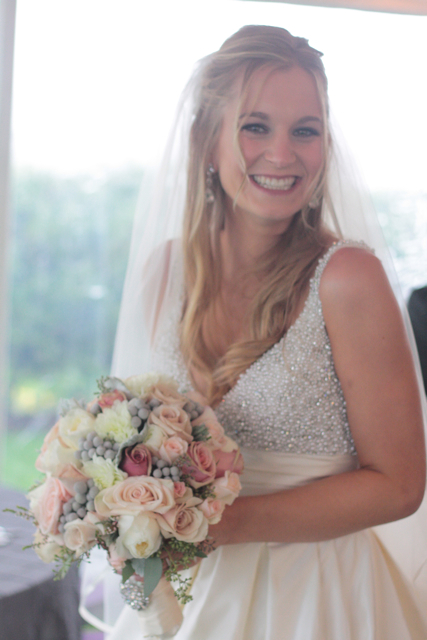 Happy married life Lindsay & Devon, we are so happy we were your floral designer!! This was yet another beautiful Loudoun Wedding.